My new year resolution, like always are many . A little bit of every good thing is that I want this year to be, to be healthier, fitter, to eat better & tastier food, to travel some more miles, to share some more smiles, to meet and make new friends and cherish the old ones, to learn more, to work harder, to love more and be a little happier this year. A little bit of every good thing is what I want this year. To set the stone rolling in my kitchen I wanted my first recipe in this New year to be a little bit of everything too. I mean easy to stir, sweet happiness, a little bit of health and some indulgence packed together in a delicious recipe. 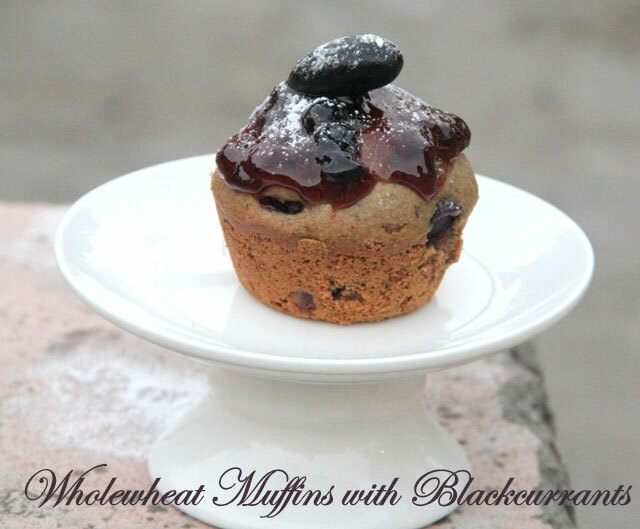 That pretty much defines the idea that went behind baking these wholewheat muffins with blackcurrants this afternoon. Ps- Incase you are wondering how did my party go, it rocked, the tikkas revived all praises and our bone-fire party was a raving hit. 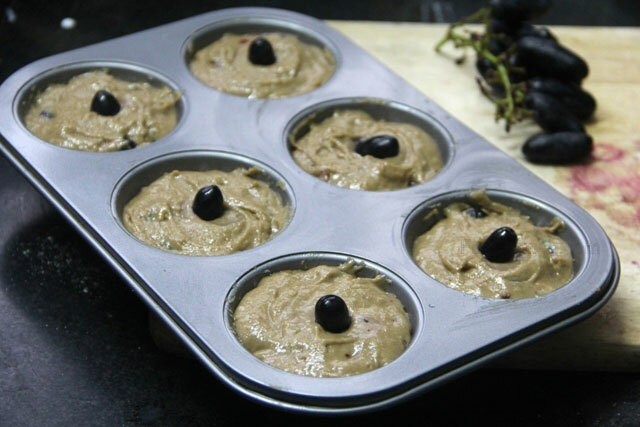 Preheat the oven to 180OC and grease/line the muffin moulds. Seive flour, baking pwd, bi carbonate of soda and salt together in a mixing bowl and keep aside. 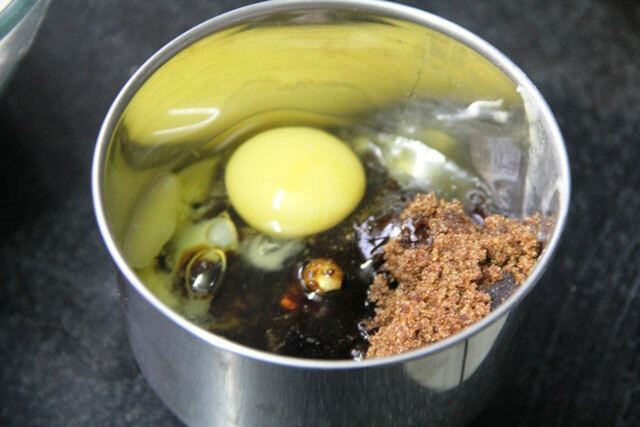 Cream the eggs, butter and sugar together in an electric blender. 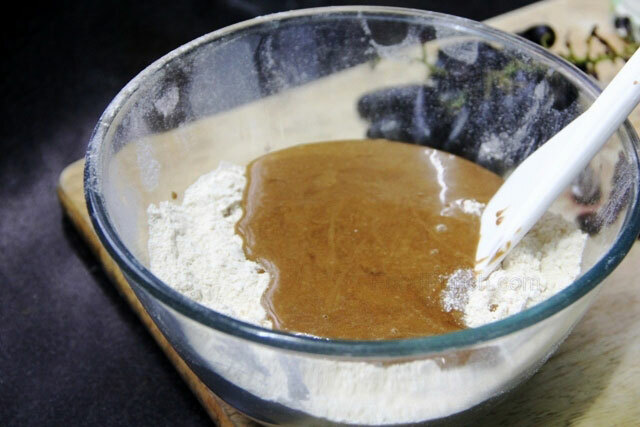 Now add and mix this egg-suagr mixture to the flour in to batches and fold. Then add the butter milk and vanilla extract and just fold enough to combine everything together. 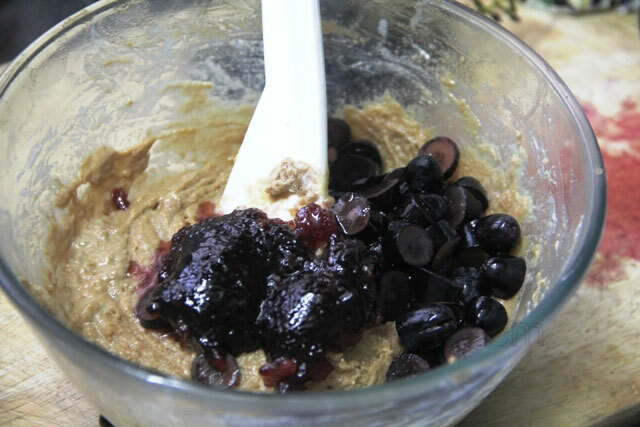 Add 3 tbsp of the black currant & a few chopped black-currants preserve in just one quick stir, do not mix leave them scattered in a few chunks here and there. 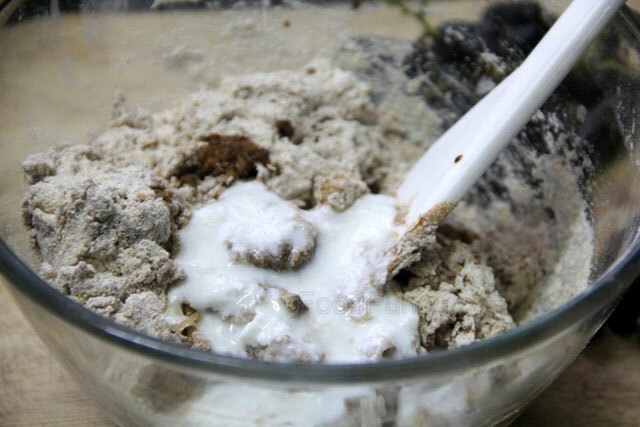 Now scoop this mixture equally into six muffin moulds, smooth out the top with the mixing spatula. 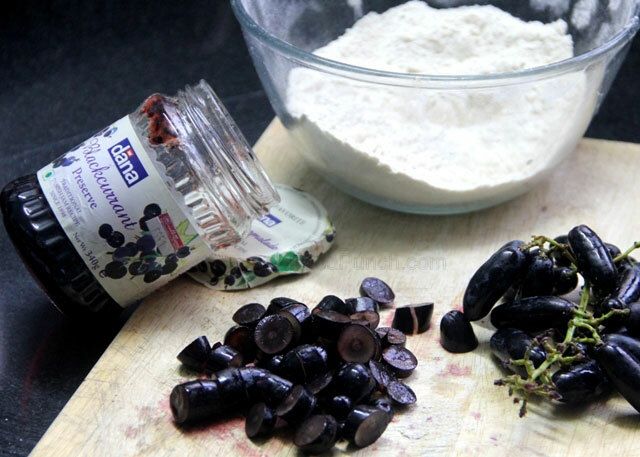 Insert one black-currant or grape (like I did) on the top centre and bake for 20 mins in the centre of the over or until a toothpick comes out clean through the center of your muffins. Leave to cool on a wired rack for 10 mins. 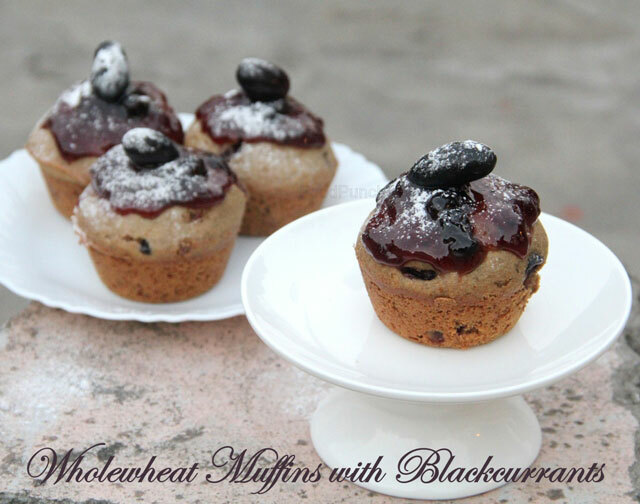 While the muffin id baking, heat the remaining blackcurrant jam with just 1 tbsp water and cool off in the fridge. 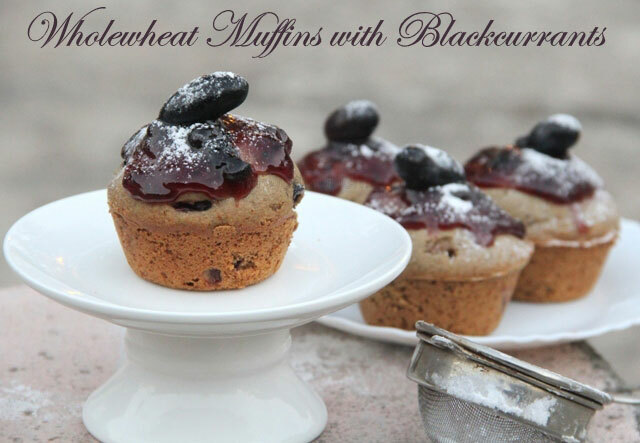 Once the muffins are cooled, spread this mixture on the top of each muffin, top with a black currant and sprinkle some icing sugar before serving. Add a preserve of your own choice; just use the preserve with little chunky fruit bites for a better appeal.